Maybe you just moved to a new area. Maybe you haven’t been in a long time. Or perhaps you just want to switch offices. Regardless of the reason, you’re looking for a new dentist in Ft. Collins. Choosing a new dental care provider is an important decision, and there are a lot of factors to consider. But one critical aspect that you simply must look for in a dentist is comprehensive dental care. When you find a dentist who can help you with comprehensive dental care, you can be sure that your care is in good hands. Essentially, comprehensive dental care looks at much more than just your teeth. This approach takes all aspects of your orofacial structures and tissues into account to diagnose and treat potential oral problems more accurately and more efficiently. At every dental checkup appointment, your dentist performs a comprehensive oral exam. Think of it as a physical for your mouth. They inspect your teeth, gums, cheeks, tongue, hard and soft tissues, and jaw for any abnormalities that could signal a serious condition. What are the benefits of comprehensive dental care? Your dentist can also evaluate the mechanics of your bite and determine if you grind your teeth while you sleep. This can cause unnecessary wear and stress on your teeth, often leading to tooth sensitivity or cracking. To help correct this, your dentist can provide a nightguard to keep your teeth from grinding or clenching. Also, your dentist can help diagnose and treat problems with the temporomandibular joint (TMJ) or the joint just in front of your ears. Many times, your dentist can start their comprehensive oral exam by asking you about your medical history and taking your vital signs. This information is not just good to know, but it can affect your treatment. Also, studies have shown strong links between your oral health and overall well-being. For example, those with gum disease are more likely to get heart disease. Through comprehensive dental care, your dentist can help you stay on track for optimal overall health. A dentist who can provide comprehensive dental care allows you to get all or most of the care you’ll need under one roof. As a result, you won’t have to find specialists for each kind of dental problem you encounter. 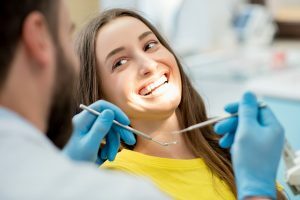 Your dentist can meet all your needs and perform all the procedures to help you keep and maintain a beautiful, happy, and healthy smile for years to come. In your search for the right dentist for you, don’t forget to find one that offers comprehensive dental care so that you can get the treatment you need all in one place. In the long run, your mouth and body will thank you for taking advantage of these necessary services. For more information about comprehensive dental care, contact your dentist Ft. Collins. Since 2001, Dr. Shiloh Lindsey has provided comprehensive dental care to patients in the Ft. Collins area. She has volunteered her services in many organizations, including Project Smile, Give Kids a Smile Day, and Dental Connections. Whether it’s a routine checkup or a complicated smile makeover, she and her staff at Aspen Dental Care offer the treatment her patients need to reach their smile goals. To schedule an appointment with her, call (970) 482-3166 or click here.